This week at In The Past Lane, we talk about the American presidency – specifically the history of how US presidents have endeavored to communicate their positions on key issues of the day. To use modern political parlance, it’s the history of “spin,” that important but sometimes tawdry business of crafting and communicating a political message in such as way that it enhances your political standing. American presidents have struggled to do this since the days of the Washington administration. 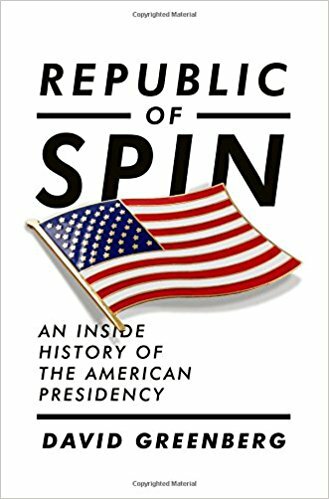 To help us understand what spin is and how and why it’s played such a critical role in the evolution of the modern presidency and in the success or failure of individual presidents, I talk to historian David Greenberg. He’s the author of a fascinating new book, Republic of Spin: An Inside History of the American Presidency. How Theodore Roosevelt created the original permanent White House spin apparatus. Why Woodrow Wilson’s Committee on Public Information during World War I is unfairly characterized as a nefarious propaganda machine. Why FDR’s “fireside chats” proved so effective in promoting Roosevelt’s New Deal agenda. How Dwight D. Eisenhower became the first president to embrace the new medium of television. Why image making became so essential to presidential success in the age of JFK. How Jimmy Carter — yes, Jimmy Carter – was hailed early on in his presidency as a master communicator and manipulator of the media. Why spin is not inherently negative but rather an essential element of presidential leadership. Why the mainstream media is held in such low regard these days.